What is a hot pot? Also known as a steamboat or a shabu shabu, a hot pot is a meal that includes a boiling pot of soup placed in the middle of your table accompanied by a selection of raw meats and vegetables. The idea is to cook the raw ingredients on your table in front of you, adding to the experience of a social and relaxing meal out. An important aspect of any hot pot is a heat source. I've had hot pot meals that are heated with electric burners, built-in stoves, gas burners, and my favorite of the methods, over charcoal. Though likely originating in Mongolia, hot pots are very common throughout the history of Chinese cuisine (most notably in the form of the spicy Sichuan hot pot) and still today. 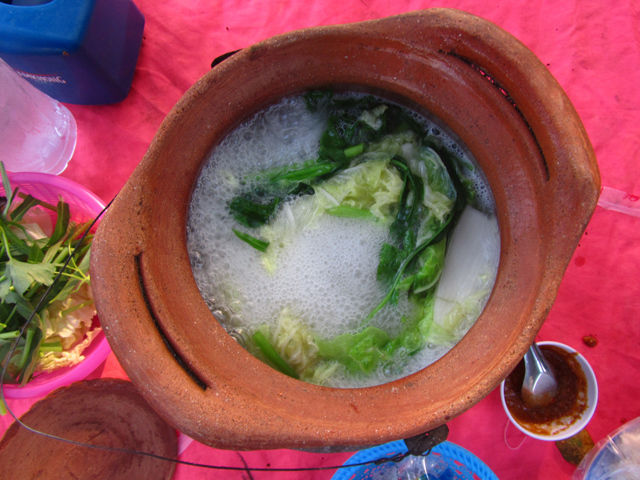 But nowadays, different versions of hot pots can be found throughout Asia, including a Laos hot pot. Along with countless opportunities to eat green papaya salad, grilled fish and chicken, and sticky rice, another common meal option in Laos is a hot pot. 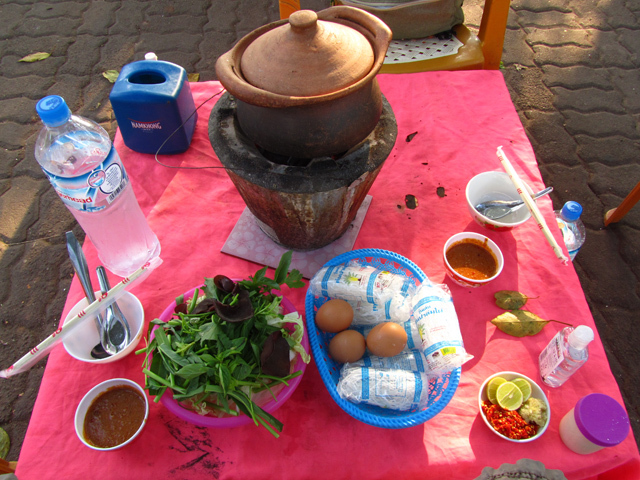 Normally served on the sides of the street or along the river's edge, the main indicator for a Laos style hot pot are the brown clay pots which are immediately evident for a restaurant that serves the dish. As soon as you order a Laos hot pot, your clay pot will be delivered to your table on top of a small clay grill filled with burning charcoal. The soup, which is normally a flavorful blend of meat broth (pork or chicken) combined with herbs and roots like galangal, lemongrass, and coriander root, forms the base of the hot pot. You then order plates of whatever you'd like to eat. 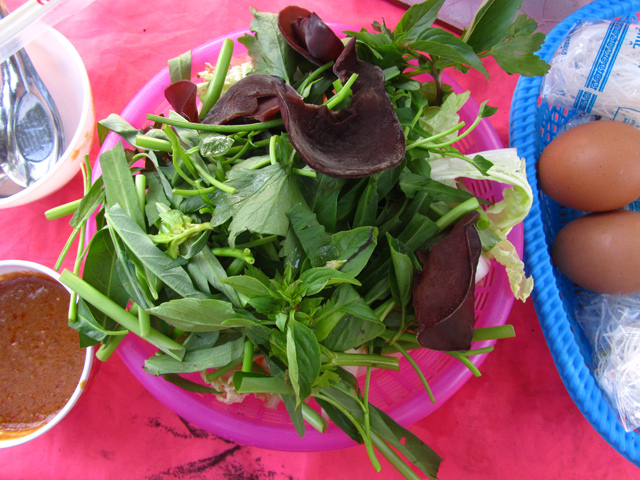 In this particular case in Laos, I ordered a huge mixed plate of fresh vegetables which included morning glory, napa cabbage, and some mushrooms, glass vermicelli noodles and a couple of eggs for protein. They also normally have plates of chicken, pork, and sometimes fish available. Sitting on low plastic chairs, enjoying the view of the river, and boiling our Laos hot pot, was a fantastic way to have a relaxing meal. 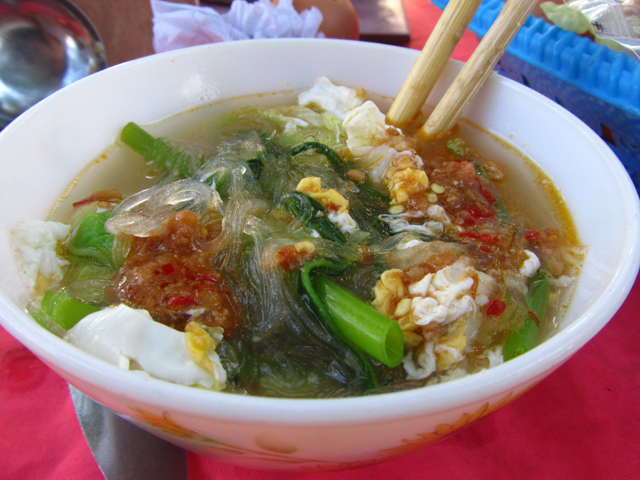 The basic cooking technique is to toss a few handfuls of veggies in the soup, add some vermicelli noodles, and finally crack an egg into the mixture. After just a few moments the soup becomes boiling hot and the ingredients are cooked and ready to be consumed. The condiments for a Laos hot pot normally include crushed chilies and minced raw garlic, lime wedges, a chili sauce, and sometimes fish sauce or soy sauce (though normally the soup is salty enough so you don't need extra salty seasonings). After my hot pot soup was fully cooked, I dished out a spoon of both vegetables and broth into my bowl and seasoned it with a few scoops of fresh chillies, garlic, chili sauce, and a squeeze of lime juice. It's often so piping hot that it's necessary to wait a few minutes before digging in, unless your mouth can handle scorching heat. In just a few moments you'll be slurping down wonderful vegetables and vermicelli noodles, with an occasional chunk of egg, all accompanied by a boost of chilies and garlic. After finishing all the ingredients from round one, toss in more vegetables, vermicelli noodles, and other ingredients and repeat the process. 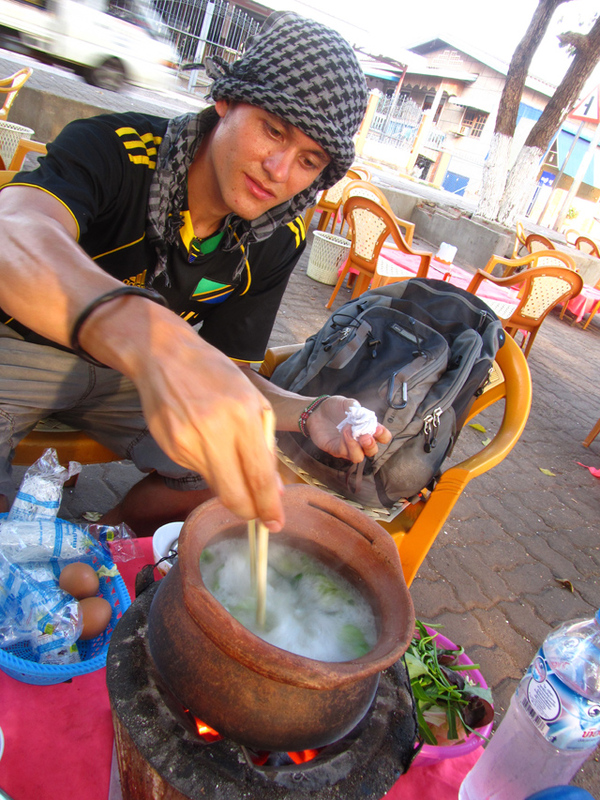 A hot pot is intended to be a leisurely meal, and in Laos it's not only relaxing to sit outdoors cooking a hot pot, but it's also pretty healthy! I’ve never been to Laos, but I remember how much I loved hot pot in China. So good! I had hot pot in Chengdu, China. 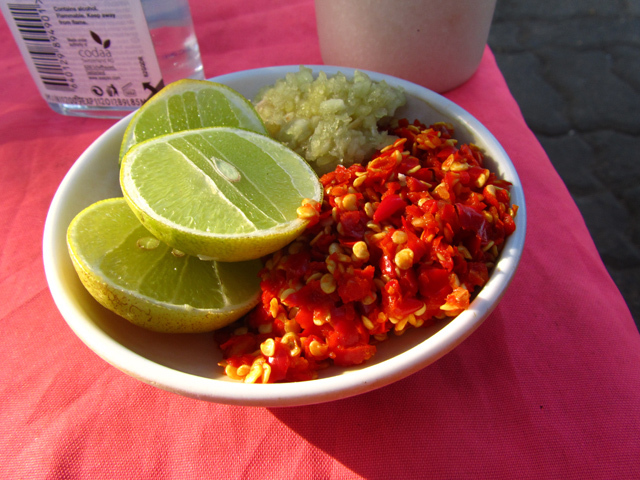 One of the spiciest dishes I’ve ever eaten, I still remember how my lips were tingling from the peppers. this looks great! cant wait to try it in Laos! Friends and I had a hot pot at the same place in Savannakhet in January. It was a great meal that we washed down with some cold Beer Lao. The sunset was very nice too. Long lost hot pot. I often sat round the table and had a big hot pot with friends when I was a student.